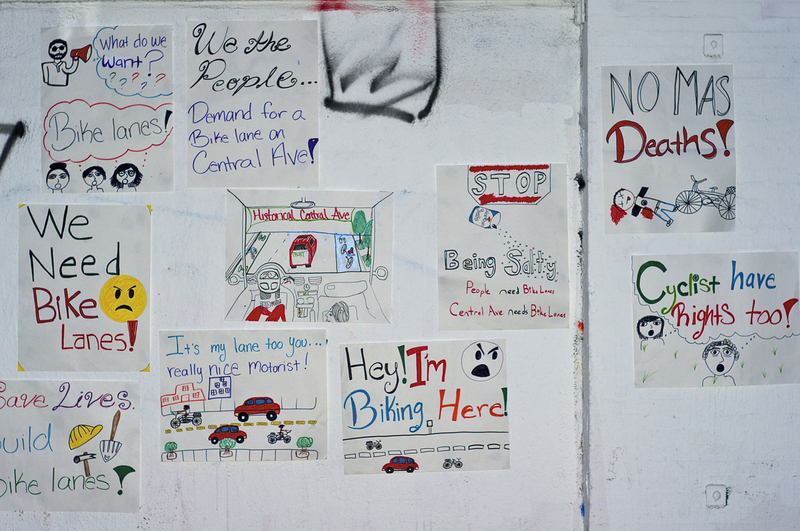 Posters demanding safe passage for cyclists on Central Avenue adorn the walls outside of TRUST South L.A. They were created by South L.A. community members. Sahra Sulaiman/Streetsblog L.A. So said councilmember for the 9th District, Curren Price, when interviewed by KCET’s Nic Cha Kim at CicLAvia: South L.A. in December of 2014 (minute 4:20). It is a perspective that many who live, work, play, and move along the Central Avenue corridor in historic South Central share. Given that the corridor communities have a median income hovering around $30,000, an average household size between of 4 and 9 people, a median age of 23, and little opportunity for economic advancement thanks to limited access to higher education, area residents are very much at the mercy of their environment. Rapidly rising rents and the lack of affordable housing around the city make it nearly impossible for them to move anywhere else. And the high dependence of many families on transit, cycling, and walking to get back and forth to work and school means that just going about their daily lives entails constant flirtations with danger. Central Avenue, boasting the highest number of cyclists anywhere in the city during peak hours (and a very steady stream in off-peak hours), has seen nearly 300 collisions between drivers and pedestrians or cyclists over the last decade. That we know of, that is. Many of those who have been hit by cars have never reported the incidents to authorities, either because they preferred to handle things informally with the driver, the injuries were minor, or the incident was a hit-and-run and they saw no point. So, even though more than three-quarters of residents are renters, the vast majority would tell you they are deeply invested in the well-being of their neighborhoods and would like nothing better than to see them become safer and healthier places for all. A father runs errands with his children along Central Avenue after picking them up from school. Sahra Sulaiman/Streetsblog L.A. Thus far, however, efforts to get Councilmember Price to sit down and have that conversation with stakeholders about their needs and aspirations have proven futile. 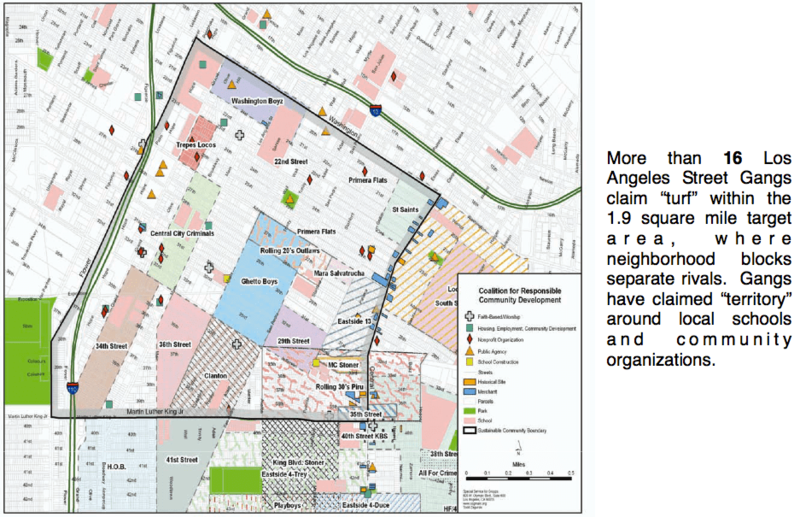 Over the past year, the community has been shut out of discussions about Great Streets’ and the councilmember’s plans to remake Central Avenue in the image of Broadway (downtown) and to remove the Central Avenue bike lane planned to help bike commuters get safely between Watts, historic South Central, and jobs downtown from the Mobility Plan altogether. The Great Streets plans for the street were only made available to the public after Streetsblog published an article complaining about the blatant steamrolling of the community. 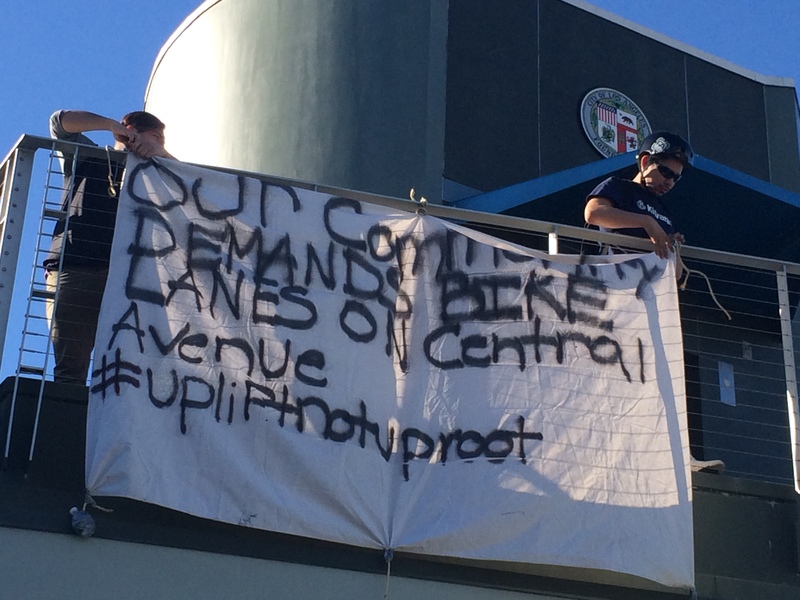 When local stakeholders tried to follow up by delivering letters to the councilmember’s office and approaching the members of the Business Improvement District, they were still not able to get any response from Price to their demands for a bike lane. Fed up with failed attempts at peaceful engagement and concerned that Price would once again try to see Central Ave. removed from the Mobility Plan at tomorrow’s city planning commission hearing, residents took action. 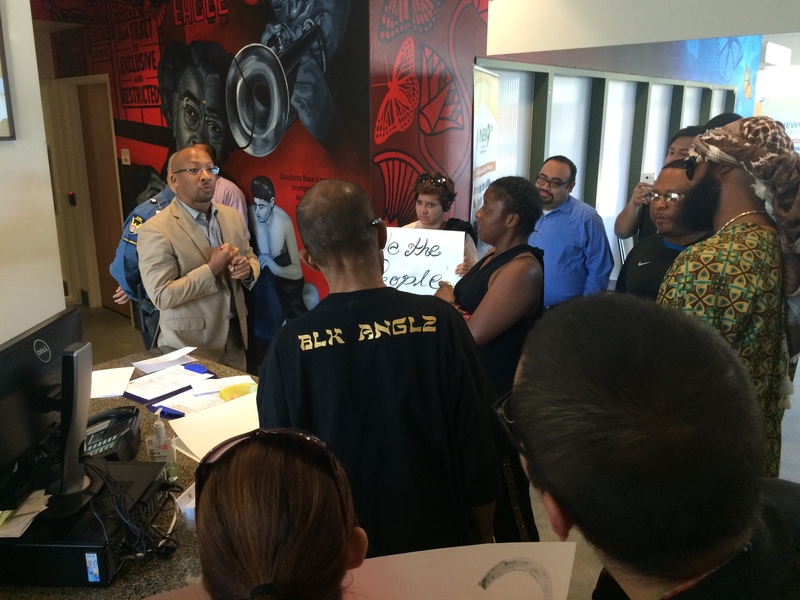 Gathering their signs, courage, a megaphone, and a banner to be hung on Price’s building, they stormed the councilmember’s constituent center at Vernon and Central yesterday. 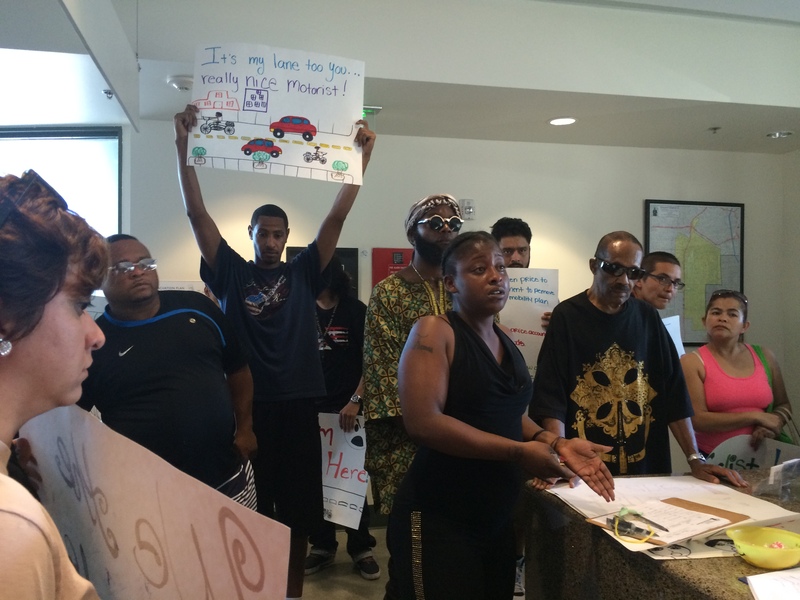 “We’re tired of coming to you!” said resident and safe streets advocate AsSami AlBasir El. Staff on site were not able to offer much in the way of reassurances. When District Director James Westbrooks was asked by AlBasir El if he would be willing to tell the kids standing there — kids that are regularly transported back and forth to school by bike along Central Avenue — that “we’re not gonna have a bike lane,” there was not much Westbrooks could say. Price made up his mind on the subject a long time ago. Sadly, the logic used to reach that decision — detailed in a statement emailed in response to stakeholders’ action — seems rather questionable. For one, Price says that safety is the key reason it would be difficult to add lanes to Central Avenue. Arguing it is “too narrow, has significant cut-through traffic all day, and has no pocket lane for left-hand turns,” he says there is no space for a lane. 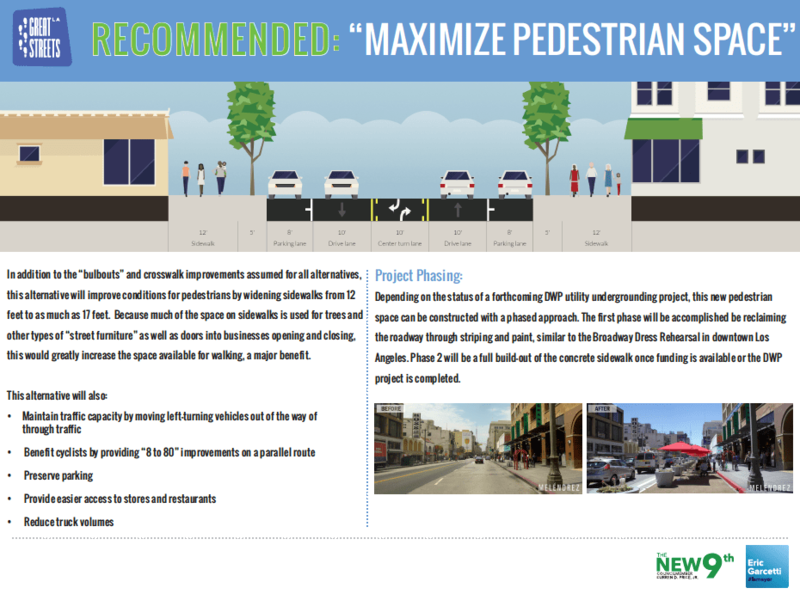 But the narrowness of the street would really only be an issue in the context of the extension of the sidewalks, as suggested in the Great Streets plan, for the very brief section of Central between Vernon and Adams. That plan (below) would put the street on a road diet and, instead of using valuable road real estate to carve out space for cyclists, install planters and bollards to make it feel like the pedestrian space had been extended. The concrete sidewalks themselves would only be extended if funding should become available (as noted in the image, above) — something not likely to happen for several years, at the earliest. Meaning that most of the street space “reclaimed” by Great Streets would likely go underutilized, possibly for years. Meanwhile, instead of taking the option to head a half-mile east to Avalon or a parallel side street (as suggested by Price and the Great Streets program), cyclists would likely continue to ride on the narrow and crowded sidewalks they ride on now (antagonizing business owners hoping to create an enticing pedestrian environment) or further slowing traffic by riding in the single traffic lane created by the road diet. No one wins in that scenario. But it’s Price’s other point that really drives stakeholders crazy. This is exactly the reason stakeholders finally stormed his office yesterday! They are tired of being uneasy and they are tired of feeling that they are constantly in danger! Unlike Price, however, because they are lower-income, are patrons of shops on Central, have kids in schools along the corridor, work along the corridor, and reside along the corridor, they don’t have a choice about where to ride. 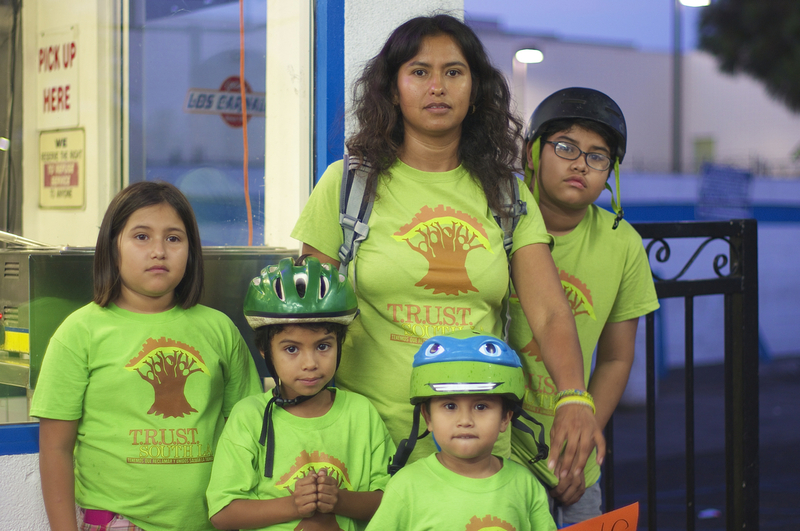 Maria Almeida and her children, all of whom move along Central Ave. by bike. Her own bike is outfitted with a saddle on the crossbar where her youngest child sits; a second child sits behind her and hangs onto her waist. Sahra Sulaiman/Streetsblog L.A.
As explained in depth here, gang activity makes the side streets a very difficult proposition for youth, lone commuter cyclists, and families. Busy thoroughfares like Central Avenue offer lots of eyes, familiar faces, and potential safe havens. And, it is one of the few streets in the area that offers a straight shot between the downtown warehouses (where many of the commuters work), historic South Central, and Watts. For folks who are trying to get to work on bikes that are in questionable condition because they can’t afford better ones or who have kids in tow, having to travel as much as a mile out of their way just to access a short stretch of bike infrastructure can also constitute a real hardship. The city would never ask drivers to make such a detour or to take the least safe route. It makes no sense to put that burden on the shoulders of the most vulnerable of L.A.’s citizens. 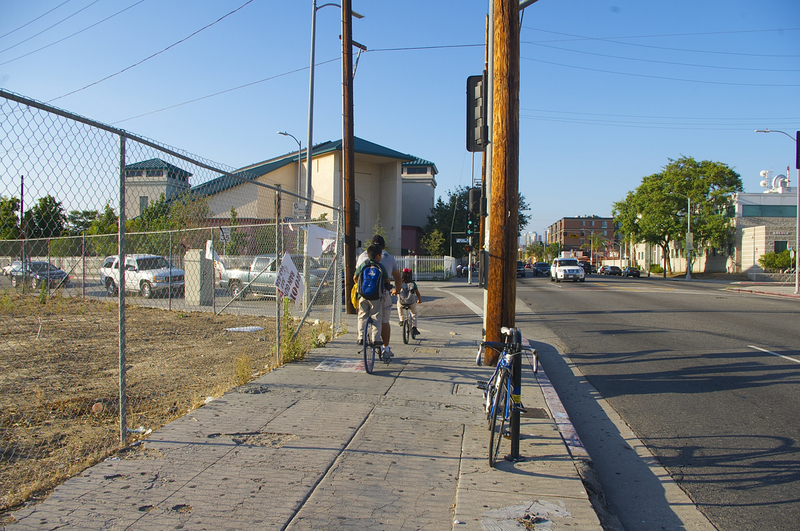 South Central cyclists are the economic engine of the community. The vast majority are riding out of necessity: they can’t afford transit, work off-peak hours, are making deliveries between small businesses, or have to get to several sites in a short space of time. Their existence is already precarious. The least the city can do is offer them slightly safer passage so they can bring home a salary to their families, get their kids to school safely, patronize local businesses, and continue to build a stronger community. If, as Price contends, he takes seriously his responsibility “to make the best…decision on behalf of the entire community,” then hopefully he will rethink his effort to see the Central Avenue bike lane removed from the Mobility Plan. Disadvantaging his constituents who struggle the most does not uplift the community. You should ask the businesses on Virgil what they think rather than assuming. The 2 accidents I was referring involved pedestrians on a certain street. My point was they assumed the issue was speed and it’s not. It’s a lack of adequate lighting. I’ve biked on that street and it’s not safe. If you’re talking about bicycle accidents, yes more accidents do occur during the day time into evening from 6am-9pm. In 2013 the highest number of cyclists killed in CA were hit from the front, that being 107 out of 141. With the majority of those accidents happening during the day, and poor visibility or not being seen as one of the causes of those fatalities, someone isn’t seeing something. I think educating cyclists about the rules of the road, as failure to yield was a factor in almost one quarter of those deaths, and to always wear their lights even in the daytime would help. But that was suggested and dismissed so whatever. The only areas I talk about are the areas I know and have experienced. If that’s offensive to you, so be it. So when someone suggested they should learn about safety, they were told those poor PEOPLE, those poor cyclists just don’t know about safety and it’s not important to teach them. Why? If a large cause of cyclist accidents in CA is failure to yield the right of way, doesn’t that mean…. LADOT doesn’t agree with you. Never mind. Have you ever biked in that lane? No, I was talking about the agenda that seems to be part of this blog. Because excuses are always made, oh you don’t understand! These people have a culture of this or that, you couldn’t possibly know why they can’t be taught how to safely ride bikes! Really? Because if they have time to speak at a rally, don’t you think they’d have time for a safety meeting? Is that so horrible? Is that some ignorance I’m showing by wanting less cycling deaths? Especially if this stupid road diet does happen? Why would anyone not want that? Why would anyone make excuses for why that can’t happen? Makes no sense. What you failed to mention is what are the odds of being hit when cycling in general travel lanes. Out of the 110 reported motorist/cyclist incidents on Central Avenue in Los Angeles between 2011 to 2015, only one (1) cyclist was rear-ended by a speeding motorist. That is less than one percent. Being hit and killed by a motorist travelling in the same direction is the similar to Commercial Jet Airplane crashes. On Average, when a jet crashes, 82% of the passengers die. But the odds are 1 in 14 million that you will be in an airplane crash. The odds that you will die from being hit from behind is 1 in 1,000 – and that is only if you were involved in a motorist/cyclist incident. The police officer stated that bicyclists “should” walk their bikes through crosswalks. That’s the officers opinion. Its not illegal to ride a bicycle through a crosswalk in Los Angeles. So someone gets killed riding their bicycle in the crosswalk, it’s already been stated that the people on Central don’t have any need for safety while cycling, and you still are going to tell people who maybe don’t speak such good English, who are poor, to go ahead! Go ride through that crosswalk, it’s your LEGAL RIGHT?! Why? Because you want to take back the streets that badly? Are you out of your mind? That’s is such a stupid and dangerous thing to tell a cyclist. People get killed, cars do not see you, but because it’s legal it’s ok? The LA Department of Transportation is telling you it’s not safe and you’re going to encourage it anyway? That is so sick and so wrong. So it is on their backs. For shame. Your belief that the drop of reported bicycle collisions is due to the additional bike lanes is fallacy of composition. Unless you performed an unannounced bicycle count on a road prior to bike lane installation and a similar unannounced bicycle count after installation to get an unbiased denominator, there is no way to tell if the accident rate decreased. There are many types of scenarios for collisions with moving motor vehicles when cyclists travel in the lanes used by motor vehicles on major streets. That could happen from the front, either side or from behind. I counted cyclists and pedestrians on Central Ave at 54th St during evening peak hours in the fall of 2015. Out of the 100+ cyclists I counted in two hours there were very few riding on the street. The opportunity for a moving motor vehicle to hit one of them from behind was very unlikely to occur since the vast majority of the cyclists were traveling on the sidewalk or to the right of moving motor vehicles. The odds of a serious injury to the cyclist in a collision with a motor vehicle greatly increases as the mass and speed differences between them increases. Trying to convince people that its a small risk will not lead to many converts to the idea. Creating infrastructure where there is less opportunity for large massed and high speed motor vehicles to contact cyclists will not only get much more people to ride a bicycle, but will also reduce the rate of collisions and serious injuries for cyclists. Oh don’t let Dennis get you down. I have ridden bicycles on roadways for over 200,000 miles and never been hit by a car. Dennis has been hit three times. I educated myself to be a better cyclist and take responsibility for my actions. Dennis feels that bicycle infrastructure will cure his poor bike handling skills. I believe both motorists and cyclists should be educated and money should be spent on autonomous vehicles and a grid to reduce human error. Dennis feels cyclists should be completely segregated from motorists. I know statically how to be safe. Dennis wants infrastructure that makes cyclists feel safe without regard if it is statically safer. I ride objectively, he rides subjectively. I feel California’s Far to Right and Mandatory Use laws are criminal, he feels they are for our safety. That said, I do respect the fact that Dennis is very active in bicycle advocacy. I just wish he would advocate for our rights not just infrastructure. Better education (both motorists and cyclists) and the repeal of laws that make cyclists second class road users would make cycling less stressful for all. Yea well, he’s not doing anyone any good by encouraging unsafe cycling. So stupid. And it’s already been said on this blog that the poor cyclists on Central have no use for safety. It makes no sense. WTF is a “safety meeting” and why do you think it would have any effect on casualty rates beyond the effect of discouraging people to participate in something? You’re a red herring factory. Spray your ignorance all you like, I find it entertaining. “Someone suggested” – when? Where? Do you really think what you’re saying is the first instance of it being said? Do you know about the safety education programs already taking place (and having absolutely no effect on casualty rates)? No, you don’t know WTF you’re talking about. Really. You have no clue and are just winging in these stupid red herring arguments. Go ahead take a survey of shoppers on Central Avenue. Ask 20 people coming out of stores how they got there that day (on foot, bike, transit, or private car, etc.). On Bloor Street in Toronto, on Market Street in San Francisco, on York Bouelvard in Los Angeles people were asked approximately the same question. Have you read this one before? Let me know if you have. You haven’t? Okay, well since you don’t know WTF you’re talking about with respect to an “impact on commerce” and transportation planning then I will tell you what those three surveys of traditional walk-up retail corridors showed: 25% or less of paying customers go to them by private motor car. 75%, seventy five percent, or more, of business on these traditional retail corridors was from people walking, taking transit, or riding a bike from where they started their journeys to the doors of businesses along that corridor. So, please, tell me WTF you are talking about when you say “impacting commerce” when we’re talking about traditional retail corridors being re-oriented back towards the foundation of their business foot traffic, i.e. people walking, taking transit, or riding a bike? Central Avenue is not Irvine or Tustin. Lot sizes are too small. Store front facades are too small. The wasteful scale of suburban commercial shopping centers and the mathematics that drive that model do not play out the same way on an old street car right of way with lot sizes and frontages that exist on LA’s many commercial thoroughfares. Sorry to take such a sarcastic tone but you come of as a complete d-bag in this comment section on this post. I can’t help myself. Interesting how you believe that it was poor riding skills that was the cause of me getting hit from behind twice by motorists when I was riding in the middle of a through lane for motor vehicles. One of those occurred when the motorist had been waiting directly behind me at a red light for some time, when I started to pedal away under the green light this motorist ran over my back wheel. The other collision occurred when a motorist looked to her left while exiting a freeway off ramp and hit me while I traveled directly in from of her. I’m sure your supposed superior cycling skill could have prevented those collisions from happening. How I could have greatly reduced the odds of those collisions from occurring would have been to not be directly in the path of those motorists when they made those driving errors. There are no statistics that indicate cycling in the middle of a through lane for motor vehicles on a major street is overall safer than riding in a five-foot wide bike lane next to parked vehicles, in a protected bike lane or on a sidewalk. The Federal Department of Transportation uses statistics to determine the level of safety provided by bicycle infrastructure. If bike lanes were less safe than riding without them, then they would not allow bike lanes to be installed. The same holds true for protected bike lanes where many that were first installed had the risks covered by the Federal DOT under pilot tests. The feds found from studies of these installations that there was not a increased risk of collisions with motor vehicles. Your trying to push personal beliefs which are based on anecdotal evidence and not statistics. Most people bicycling along major streets in Los Angeles are riding to the right of moving motor vehicles or else are riding on the sidewalk. Since that is where the vast majority of people bicycle, it stands to reason that these types of riding are where most collisions with motor vehicles would occur and not in the middle of motor vehicle through lanes where very few people ride. Your conclusion seems to be that since most collisions occur riding to the right of motor vehicles or on the sidewalk, then riding directly in front of motor vehicles has to be safer because few people get hit there. Since police reports never mention whether the bicyclist that was involved in a collision was riding to the right of, or directly in front of a motor vehicle, you conclude that it has to be safe to ride directly in front of moving motor vehicles. There is no statistics to support that belief. I never stated or indicated that cyclists should be completely segregated from motor vehicles. However that would greatly decrease the odds of getting involved in a collision with a motor vehicle. Not only did the estimated number of bicycle commuters in Los Angeles rise by 21% in 2013, the amount of bicycle boarding’s at Metro rail stations increased by 42%. Strong indications of a significant increase in bicycling. If the installation of 190 miles of bike lanes had no effect, or decreased the safety of bicycling, then there should have been a significant rise in the number of LAPD reported bicycle collisions compared to the previous year due to a likely significant increased amount of bicycling. That didn’t happen. In fact, bicycle collisions dropped in 2014 and are down 6% in the first 6 months of 2015 compared to the same months in 2014. Can’t help yourself? Understatement of the year Sparky. You were being sarcastic? Gosh, you sounded like a straight up jerk to me, no kidding. The Coca Cola Bottling Company is a small lot? What about that huge produce market north of the 10? Is that a small lot? Nope. There are also several other large warehouse stores on Central, did you not know that? How do you think those places get their goods? You know Central gets the overflow from Alameda, right? So a survey in SF has what to do with LA? A survey in Toronto has what to do with LA? SF and Toronto have great public transit systems. There are alternatives to driving. York Street? Not nearly as industrial as Central. Please, get back to me when you have something relevant or even half way stimulating to say to me. Better yet, maybe step off for good. I don’t care what you think of me, so you can be nasty all you want. That says more about you than it does about me. You find it entertaining that safety for bikers on a busy street with a ton of trucks isn’t taken seriously? Uh-huh. Are you this dumb? This is what was said when safety was brought up on this comment thread genius. How is a red herring something already talked about here? THIS is what I’m talking about. I wasn’t the first one to bring it up. Pay attention and go take your aggression’s out on someone else. Get a life. You are so far behind. So now you think teaching cyclists about safety would discourage participation? Oh that’s genius. Really, really smart there. Safety isn’t important to the people on this blog. It’s been stated in the above quote, and in the person encouraging riding a bike through the crosswalk. It’s not a red herring, it’s been the topic on here. Get some glasses or something or learn to read. What a weirdo. Is English your second language? Do you not have a grasp of idioms, subtext, and conversational speech? So you literally have nothing. You have no empirical evidence that automobile volume and speed, and hostile street design for pedestrian and bicyclists, benefits or hurts businesses. But because you see massive trucks use the street you assume that business will be hurt by configuring the streets towards walking and bicycling. Sounds like a losing argument on your side. You brought up safety training in a COMMENT SECTION OF A BLOG and think that somehow invalidates the research into the impact of street design on street user safety? First, the LACBC has Operation Firefly, C.I.C.L.E.org does adult bicycling education, and the League of American Wheelmen teach Road 1 effective cycling classes. There are efforts being made by the people you are bizarrely criticizing as “SJWs” to do exactly as you say. Your own ignorance on the matter of safety education is the only thing you keep exposing. Second, safety classes do not make the streets safer. The cyclists involved in the majority of collisions are some of the hardest and most time consuming people to reach through large public efforts to educate people. This is why better street design is recommended time and again. A better street design would get cyclists riding in safer places and positions in the street, would slow cars to their average travel speeds (instead of 40mph between red light), and would help pedestrians do what they have to do with minimal risk, noise, pollution, and hassle. Please, do some research into the matters your have commented on. The LACBC does Operation Firefly. CICLE.org does adult bicycle education. The League of American Wheelmen teach Road 1 effective cycling classes. The above are the group of folks you are referring to as “SJWs” and they are doing exactly what you have prescribed. The populations involved in the majority of bicycle related crashes are never going to be the people who go to these classes. That is why better street design is recommended by experts around the world. A staircase with no handrail is measurably less safe. It just is. You can post signs, you can hold safety classes, you can force people to wear stair climbing helmets. The fact remains: staircases without hand rails are much more dangerous than staircases with handrails. You’re totally off-base with what you assume is a critique of the livable streets advocacy movement. You have continued to expose your childlike naivete on these issues and then transferred the anxiety your ignorance brings you onto people working towards the “solutions” you assume will allow the status quo to continue. People working on those “solutions” have made tiny gains in street safety relative to better street design. Hi DG, so you’ll support bike lanes in this community only once all the community members have bikes and equipment you deem to be adequate and they provide proof of training to safely operate said equipment? Are there any other demands you have for the community before you’ll support installation of bike lanes in their community? Where should community members go to have their equipment inspected and provide proof of training? A valid point. Adequate lighting is key for safety. I’m talking about what this person said in THIS conversation. You are a nut job and are not worth my time. Go attack someone else and get off my $ick. I’m not addressing anything else with you. Then go argue with someone else, you’re a jerk and I’m done with you. The above question was not directed at you. Go bait someone else troll. Is that how you admit that Toronto and SF have no bearing on what happens in LA? Citing irrelevant information is useless. The people on this blog speak for them. And apparently, none of them care about safety. There is a really odd agenda here and they want to keep them ignorant. I don’t get it. It’s an open thread. I can respond to whatever comment I want. The same type of survey was done on York Boulevard in Los Angeles with the same type of results. You have nothing to refute the universality of the modal split findings from these studies in a traditional commercial street. You literally know less than nothing about what you are speaking. I’ve pointed out several programs that already exist doing exactly what you claim to want to have happen. Net effect: too small to measure. Infrastructure is almost universally proposed because it is effective and relatively affordable. There is no device or training for the public that I am familiar with that will drop collisions 25% or more. Please, show us your evidence. SJW indeed! Of course you can! I’m just not going to be baited by your comment. Oh trust me, you have nothing and now you are moving the goalposts. So the same study was done on York with similar results to what? To Toronto and SF which are irrelevant? What do York and Central have in common? Did you actually read the study about York you’re talking about? Because, that study is for streets that are largely residential and have at or less than 20,000 cars using them everyday. That’s what the places in that study are about. Even the Great Streets web site says Central has between 20,000-25,000 vehicles per day (but I think it’s more because the Great Streets web is going to be a bit biased) and they only cite one street in SM as a success, the rest are in WA and OH and one in MI. Plus nearly all of them saw an increase in traffic or no change, but no one cares about that. The study on York doesn’t apply to Central and it’s also so contradictory on almost every point, depending on the criteria as the author states over and over. But none of that matters because that study doesn’t apply to Central, because York doesn’t have the volume Central does. However, considering the streets in the Great Streets website that are cited, there was an increase in traffic on the road diet streets. Now, how does increased traffic make people want to shop somewhere? How does increased traffic show that people are choosing to ride a bike? It could also be that the increase in traffic has made people nervous about biking near all that traffic. If the volume of cars has not changed, how is that a success for bicycles? That means there hasn’t been a huge shift to biking on that corridor, yes? And considering the lanes went from 4 lanes to 2 lanes, are we supposed to believe congestion has not changed or is minimal as the Great Streets site suggests? Do you believe that? Because I don’t. But you believe what you want. Or move the goalposts, whichever fits your agenda. And everyone lies anyway for click bait, just ask the editor. So what are you supposed to believe? Skewed studies that admit they are contradictory? Uh-huh. I guess if it fits your agenda, it must be true. You go for it. You have nothing except a keyboard and an opinion. I win. It’s not a contest. Ha! You crack me up! You think you have “won”? Won what? Oh man! You’re too much! Ok honey, if that’s what you think, if you just can’t see the forest for the trees, if you have to feel that way to survive, if you hit the stop sign, you go on with your bad self. Several programs? Several programs that wouldn’t appeal to the people you’re talking about which you’ve stated. How would you know? People on here claim they know whats best for this corridor, yet they refuse to admit some type of safety training could help. Then it goes back to how little the rest of us understand about THESE people. As if they are so different than the rest of us. Is that what you want me to believe? Because here you have a core group of people who may or may not have a language barrier who are always going to bike, and this whole road diet is supposed to make the streets safer, right? Right? Really? There’s time to get them to march and go to the office of a politician and make demands and take pictures of that trip, but one simple day where the advocates of this road diet can’t give a safety lesson to them is out of the question. Let me be clear, if you’re going to use these people for your agenda, the least you could do is make sure they are safe. But that’s not happening. Instead we’ve got some one saying there’s too many barriers to get them to do anything about safety, and a guy who has been hit on his bike 4 times adamant that it’s legal to ride in the crosswalk (despite the danger) and we have you. Who didn’t even know what I was referring to for half of this conversation. Swell. Central Avenue has long been known as one of the more pedestrian- and bike-unfriendly streets in the city. It is a fast-moving thoroughfare (especially at night) whose traffic patterns are made more complicated by the number of heavy trucks that trundle down it around the time that school lets out.